Imagine: It's the middle of the week when suddenly you realise that you don't have a gift for the baby shower you're attending on the weekend. The prospective parents live interstate and you haven't been in touch for a few months, so you have no idea what they need for the baby/house/themselves. You've spent most of your money on plane tickets to visit your sick dad and have a budget of $30. This happened to me this week. The baby shower is on tomorrow, but never fear, dear readers, I have made my friends and their baby an adorable, practical present - and have enough spare materials to make two more sets! I recently had dinner with some friends, two of whom had babies, and the common theme that cropped up all night long was this: you can never have enough bibs or burp cloths. So it was a no-brainer when it came to choosing what to make for my friends. I spent a few hours during the week looking up tutorials on bibs and burp cloths - it turns out burp cloths are super-simple! - and went with Heather Bailey's Slobber Monkey baby bib, although there were heaps of others that looked great (list at the end of the post). 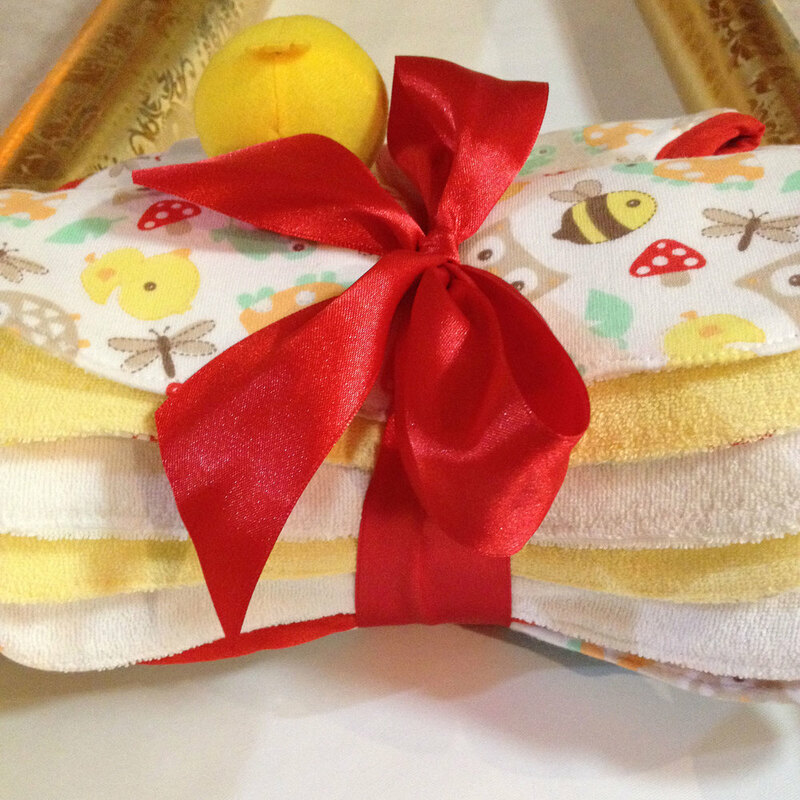 I was inspired by the Burp Cloth Gift Set tutorial by Dana at MADE, but in the end only followed the tutorial loosely, as I couldn't find a small package of cloth nappies (diapers) and grabbed a 12-pack of super-cute baby face washers instead ($6, 23cm x 23cm). The face washers are made from a really soft, lightweight french terry (Wikipedia linked for your convenience, in case you're like me and didn't know what french terry was until just now). For my main fabric, I bought a three-pack of interlock baby wraps ($12, 80cm x 80cm - I bought the middle set in the image below). There was a sale on cotton knit pyjama pants, so I also grabbed the largest pair I could find for $3.50 - a bargain for around 1m x 1.5m of soft cotton jersey! I didn't use the pants for this project, but will for the next set of these that I make. For this gift, I made two bibs and four square(ish) burp cloths/drool-catchers. I used one of the interlock baby wraps and four of the baby face washers, plus some white flannel, red bias tape and a spare towel from when I made the hooded towel for my niece. * I couldn't find an image online for the duck wrist rattler because - as it turns out - they were recalled due to their care instructions tag being a choking hazard! No wonder they were on sale. I've just un-done my careful wrapping of the present to make sure this one didn't have a tag on it. It looks like they've removed the tag but left some little threads from where they'd unpicked the stitching, so I pulled those out and re-wrapped the gift. Phew! I forgot to take photos as I went (surprise, surprise) so I'll put my mini-tutorial after the pics. I say mini-tutorial, because really, there are already a bunch of great tutorials on how to construct a bib out there. This is really about my process, experience and lessons learnt. First, I laid out the baby wrap, then traced two bibs onto it. I laid four of the face washers out on the fabric and traced them too. I was actually able to fit six washers next to the two bibs, but only used four, as I wanted to save the other washers for a different project. As you can see in the pic above, I used the solid white and yellow ones, as I thought they coordinated best with the fabric. The tutorial from MADE suggests 10"x18" (25.4cm x 45.7cm) but I'm hoping the 23cm square washers will still do the trick, as drool-catchers if nothing else. Using one of the other interlock wraps and some cloth nappies, I'll probably be able to make one bib and four burp cloths or three bibs and three burp cloths, instead of two bibs and six drool-catchers – still good value. Once I had everything traced, I cut them out and put them to the side. Next, I traced and cut two more of the bib from the white flannel, and another two more from the white towel. I then matched up my pieces, right sides together. For the bibs, I put the flannel and the interlock right-sides-facing (not that there is a "right" side to white flannel) and then placed the towel layer on top of the flannel, so it was towel-flannel-interlock. This way, the towel would be encased between the flannel and the interlock when I turned it all right-side out. After that, I sewed it all together, leaving a gap for turning. I used my overlocker (serger) but this could have easily been done on a sewing machine instead. It might have even been easier for the bibs! I actually had so much trouble overlocking the first bib – first with the tricky curves, then turning it inside out and struggling with the little straps, then discovering that the flannel layer had escaped the overlocker around one of the corners – that I rearranged my layers on the other bib so that it was all right-sides-out (flannel-towel-interlock) and just overlocked the raw edges together. After I turned everything right-sides-out, I pressed them flat, with the gaps turned in so they'd be nice and easy to top-stitch shut. There were two lessons learnt here: first, because overlocking leaves such a small seam allowance, it actually makes it harder to neatly turn in the gaps, because there's such little room for error and the tiny seam allowance won't stay in place on its own; second, pressing makes everything better! I will never cease to be amazed at how pressing can take a project from a disaster to something you're comfortable giving as a gift. After pressing, I top-stitched each item 2mm (or whatever the little line on my presser foot is) from the edge. For the bib that had the raw edges showing, I edged it with some red bias tape. I'd like to say I chose red because it coordinated with the little mushrooms, but honestly: it was the only bias tape I had in my stash. I would have preferred white, as I could have made it neater on the back without anyone noticing the stitching, but as it is, I just left the back a little bit messy. All the raw edges are enclosed, and it's the back, so I doubt anyone will really notice. Plus, I do love the 'pop' it gives the bib. Anyway, after the top-stitching/bias-tape, it was back to the ironing board for a final press. The interlock and french terry combination stretched out a little when top-stitched on my sewing machine (I don't have a walking foot), but it was nothing a quick steam-and-press couldn't fix. Pressing also made my bias binding mess look much more acceptable. Again with the disaster-to-gift magic of the iron! Even though it was born of my frustration, I quite like the alternate bib with the bias tape. It gives the whole package a bit more colour and makes it look more like a complete package and more fully thought-through as a gift combination. Two identical bibs might have looked like I just made two because I wasn't sure what else to include, but by giving it a different look, it nicely complements my pairing of the yellow and white drool-catchers, turning the gift into two complete sets, rather than a set plus a spare bib. Normally when wrapping several items together, I'll just stack it all up so it's roughly square-shaped, then wrap. This time, I wanted it to look special, so that it was obviously a set, but still obviously handmade (rather than homemade) with love. I spent a while rearranging the items until they were just right, and I'm satisfied that the gift will have the ooh-factor when it's opened. Pressing will take a project from disaster to delightful! Not so much a lesson learnt, but a lesson reinforced. Sometimes a contrast binding can take a project from cutesy to couture - just don't go overboard. Presentation will take a handmade gift from thrown-together to thoughtful. Overlockers and curves are not friends, and just because you can use the overlocker doesn't mean you should use the overlocker. Sometimes the sewing machine is the better tool for the job, even if it is a knit or horrible, messy towelling. Low-end department stores are a great source for cheap knit fabric… as long as your pattern pieces are small enough to fit into a pair of size 18 pyjamas. There are so many great and free bib patterns out there, I feel like I really should give the others on my shortlist an honourable mention. Easy Reversible Bib Pattern by jRox Designs - this was actually my first choice, but I preferred a flat-cut pattern instead of one cut on the fold. Lazy, I know! I will probably try this one next though and just print it out twice to make it flat-cut. The Classic Pretty Little Baby Bib Pattern by Amy at Nana Company - incredibly adorable! Placemat Bibs by Dana at MADE - really clever, but not quite what I had in mind.